Dejaune Clark was smiling from ear to ear Monday night after getting a haircut from Josh Kruel for free. “I feel relief. This would have cost me $20,” said Clark, an 18-year-old student at DRW College Prep. 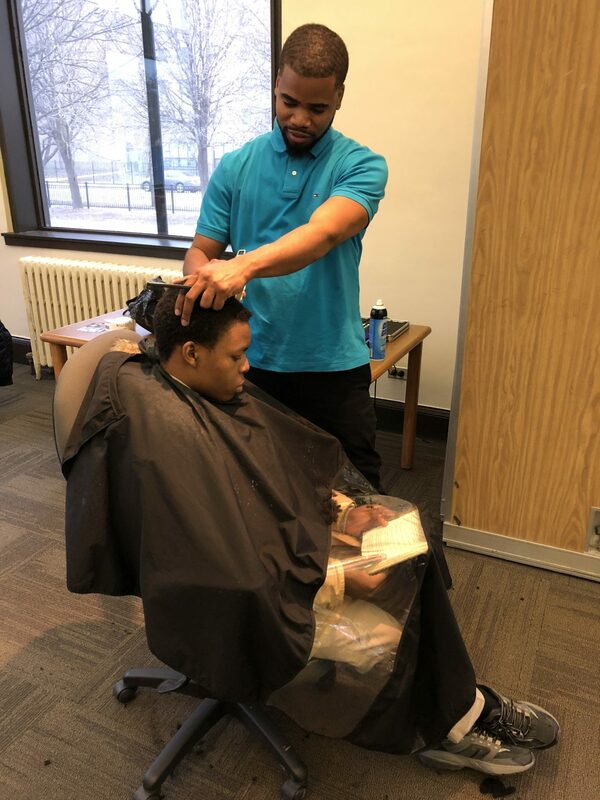 This was the second time this year the Austin branch of the Chicago Public Library hosted the “haircuts for teens” program. Teen librarian Armena Ketchum said when the branch reopened in February after major renovations she wanted to get teens interested in the resources offered at the library, 5616 W. Race Ave.
“What better way to get them excited about coming to the library than to offer free hair cuts?” Ketchum said. While the handful of teens waited for their turn to get their haircut, Ketchum read aloud the book “Crown” by Derrick Barnes. The book illustrates the power of a good haircut and how it affects every day life by instilling confidence. “Haircuts for teens” is a free service for teens ages 13-18, not just from Austin but other neighborhoods as well. 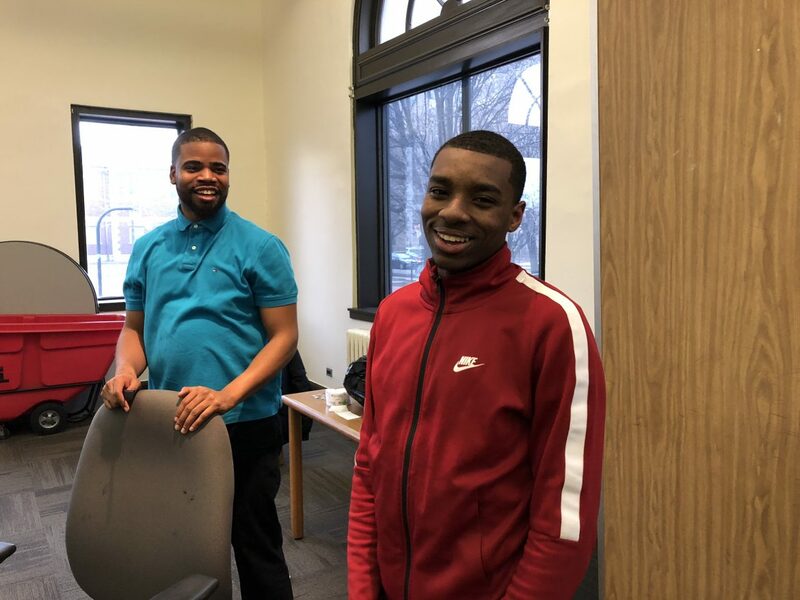 The program serves many purposes, including inspiring teens to believe in themselves as well as encouraging them to pursue a profession they’re passionate about. The 28-year-old Kruel said his family was originally from Austin and moved to Naperville when he was a child. He attended Naperville North High School, then transferred to a high school in Texas to play football. Kruel went to Texas Barber College and currently works at Whatever It Takes Two in Aurora. Kruel said he met Ketchum at an event in Chicago where she approached him about the library’s teen program. The idea of participating in “haircuts for teens” reminded him of when he first started giving his friends haircuts as a teen. Kruel, also known as “Kool Le Barber,” was at the first library’s first teen haircut event held Feb. 7 and plans to continue participating at the monthly event; the next event will be April 9 from 5 to 7 p.m.
Kruel said having the opportunity to help improve the program and make it grow helps him stay involved in Austin, a community he is passionate about. His long-term vision is to make it a meeting place for teens to share ideas and engage in educational activities, including exposing them to a variety of professional industries. He hopes to also offer catered meals. Dejaune Clark (right) after getting a free haircut from barber Josh Kruel. There will be games and prizes, refreshments, entertainment and fun 4 to 7 p.m. July 25 at 5724 W. North Ave.